New Life for the Atlanta's Emory University unveils a unique collection of Egyptian mummies and decorated coffins. BRAHAM LINCOLN, GENERAL GRANT, EDWARD VII, AND THEODORE ROOSEVELT were among those who once admired the ancient Egyptian coffins and mummies displayed at the Niagara Falls Museum in Ontario. Brought to Canada in the mid-nineteenth century, the collection languished as fewer and fewer visitors patronized the museum, which in its final incarnation included the "Daredevil Hall of Fame" and was housed in an old corset factory. Despite the apparent quality of the individual coffins and mummies, no Egyptologist had ever studied them comprehensively and they were never published. Now, after nearly 150 years in Niagara Falls, the collection, reinstalled at the Michael C. Carlos Museum at Emory University, has been rescued from public obscurity and scholarly neglect. The collection-over 145 items, including ten coffins and mummies along with funerary figures, canopic jars, amulets and jewelry, bronze sculptures, pottery, basketry, wooden objects, and relief fragments - dates from the 21st Dynasty (1070-946 B.C.) to the Roman period (31 B.C.-A.D. 395). Particularly well represented in this group, the 21st Dynasty was a period of great artistic achievement in funerary art. 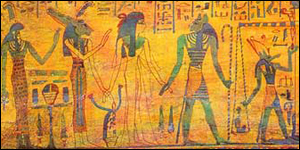 It marked the beginning of the Third Intermediate Period (1075-656 B.C. ), a time of political turmoil and economic decline that saw control of the country split between pharaohs reigning in the Delta and the priesthood of the temple of Amun at Kamak ruling in Thebes. All the effort that had once gone into creating elaborately decorated tombs was now concentrated on coffins, the designs on which have been justifiably compared to stained glass windows in medieval cathedrals for their complex rendition of theological concepts in intricate, jewel-like colors. The Egyptian Gallery contains a most interesting collection of Egyptian Antiquities and Casts of the principal curios ever discovered in that country. The Mummies are the only ones of Royal Personages exhibited in America. One of the three is the only perfect specimen in the world. Brochures for the now-defunct Niagara Falls Museum touted not just its Egyptian collection, but also "The most interesting collection of deformities in the world. Some of the most wonderful Freaks of Nature you will ever have the opportunity of viewing, Etc." The museum, founded in 1827 by Canadian natural history enthusiast Thomas Barnett, was first housed in an old brewery. As it grew, it added to its holdings a shell and coral collection made by Harvard biologist Louis Agassiz, a humpback whale skeleton, a 77-foot diameter slab of a redwood tree trunk displayed at the 1901 Pan American Exposition, a saddle used by Wild Bill Hicock, a five-legged pig and two-headed calf, and barrels used by daredevils who braved the falls. Most of the mummies and coffins were purchased in Egypt by a Montreal physician named James Douglas, who then sold them to Sidney Bamett, the museum founder's son, who acquired Egyptian objects to appeal to the public's growing interest in the land of the pharaohs. Douglas recorded in his 1860 journal that he dealt with Mustafa Aga Ayat. The consular agent for Britain, Belgium, and Russia, Ayat was a key figure in the antiquities trade at Luxor in the mid-nineteenth century Taking advantage of his diplomatic immunity, he acted as a go-between for wealthy tourists and tomb robbers like the Rassul brothers, whose illicit discoveries included a cache of royal mummies at Deir el-Bahri near the Valley of the Kings. Over the years, the museum changed hands and locations, its last home being the Spriella Corset Factory. But the introduction of casino gambling brought prosperity to Niagara Falls, and the property's increasing value led the museum's owner to sell it. Emory's acquisition of the collection was made possible by public support from the Georgia community. In the fall of 1998, Canadian businessman Bill Jamieson, who had purchased the museum's collections, announced he was selling the Egyptian antiquities for $2 million. No Canadian museum stepped forward to purchase them, and that November we went to inspect them. We were amazed by the collection's extent and quality, and Anthony Hirschel, director of the Carlos Museum, and the board of trustees backed its acquisition. With a deadline of seven weeks to raise the money, we received a $250,000 grant early on from the Forward Arts Foundation, an Atlanta-based organization that supports the arts in Georgia. But we were running out of time and had to appeal to the public with the help of the Atlanta Journal-Constitution. Eventually more than 300 people contributed-from school children, to Atlantans who pitched in $10, to a museum docent who passed the hat among friends and netted $15,000. In March 1999, the sale was completed and two months later, the collection traveled to its new home. BENEATH THE WRAPPINGS Over the past 25 years, the study of mummies has been greatly enhanced by new technologies such as CT scanning, endoscopy, and electron microscopy Application of these techniques was a priority when the mummies arrived in Atlanta. We wanted to document how they were mummified, examine them for evidence of disease or trauma, and get a thorough understanding of their condition before proceeding with conservation measures, Between October 1999 and May 2001, nine of the mummies were taken to Emory University Hospital for X-ray and CT examination. Five of them - three men and two women, ranging in age from about 20 to about 40 at death-date to the 2st Dynasty, when the quality of mummification was at its height. Only two of them, however, had been treated carefully; most had numerous fractures, the result of rough handling during mummification. The body of a woman named Taaset was intact enough to be a candidate for endoscopy, in which a fiberscope was inserted into her body, enabling researchers to see inside her. The examination revealed a remarkably well preserved brain, lungs, and liver that had been left inside the mummy and provided tissue samples for later study. © Copyright 2019 Bigskymuseums.com All rights reserved.